Indonesian designer Alvin Tjitrowirjo has created five new pieces of handmade furniture, designed to promote rattan as a high-quality material. Called Tropicália Modernity, the colourful furniture collection features a lounge chair, a dining chair, a matching bench and stool, and a rocking horse. Tjitrowirjo unveiled the collection at Milan design week, with his design studio and furniture brand AlvinT. All the items in the collection are made entirely out of rattan, a natural wood material derived from palm trees. The material is traditionally woven into strings or textiles for use in furniture and homeware, but can also be a solid wood. Tjitrowirjo's pieces feature solid rattan beams that have been bent into geometric shapes. "All these pieces are basically my way of trying to explore the beauty of rattan," the designer told Dezeen. "These are the modern contemporary version of traditional rattan." "It is seen as a cheap and cheerful underdog material that is heavily underrated. This is something we want to change," he explained. Indonesia is responsible for over 70 percent of all the rattan production worldwide. But according to Tjitrowirjo, almost all the good quality material is exported, both legally and illegally. He hopes to change this by encouraging Indonesian designers to start working with rattan. "Rattan is a material that belongs to Indonesia," he said. Tropicália Modernity is designed to highlight the "exotic yet contemporary" possibilities of the material. Each furniture item was coloured using a patented technique developed by German company Karuun, where the capillaries of the rattan are injected with colour and bulking agents – a process that makes the material firmer and water resistant. "Rat­tan's structure is compara­ble to a bundle of tubes. The rat­tan palm can transport wa­ter up to 200 me­t­res th­rough its long capillaries," said Karuun. "When the capillaries are injected wi­th various bulking agents, rat­tan is trans­formed from a wood wi­th limited use to a ver­satile, innovative mate­ri­al," explained the brand. The Bhuana Lounge chair has a two-pronged back and a caged, round base made of rattan beams. It comes in bright blue and pink. 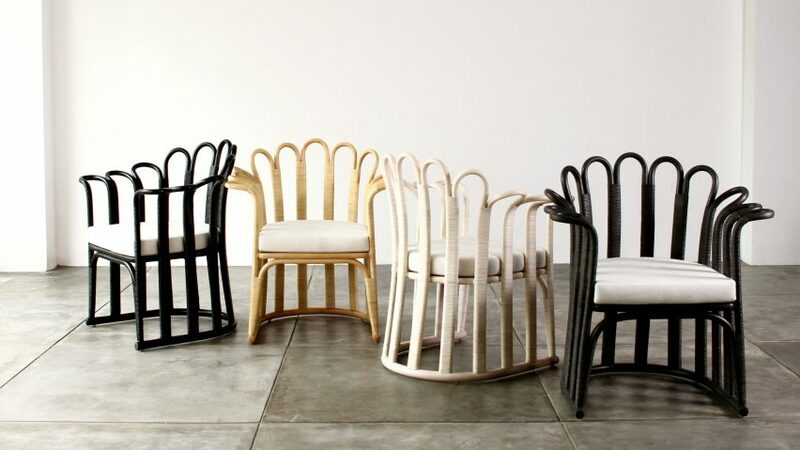 The Malya Dining Chair comprises a series of curved rattan canes that form a petal-like shape. The individual beams are bound with a rattan wrapping. It comes in various shades, including bright red and pink. The Loop Stool has a lattice framework with triangular legs that taper inwards. The matching Loop bench has a similar structure but is larger. They come in shades of pale blue and pink. The collection also includes the Lumping rocking horse, which features a patterned body body made from rattan woven in two shades. The Tropicália Modernity collection was on show at Palazzo Litta throughout Milan design week, which took place between 9 and 14 April. Also on show at the same venue was a mirrored pavilion designed by Chilean architecture studio Pezo von Ellrichshausen.